Whether you’re planning a romantic getaway, a DC shopping trip, a family vacation or a last-minute escape, The Georgetown Inn offers great deals with our best available rates. Reserve one of our packages and enjoy special rates on attractions and tours, newly renovated accommodations, and exceptional services and amenities. Family vacationers and Baby Boomers can take to the road and experience beautifully-appointed guest rooms and suites at The Georgetown Inn. With our AAA discounts, enjoy premium amenities including valet parking, complimentary WiFi, our 24-hour business center, and complimentary access to Washington Sports Club located on M Street. Our StayCation Package is designed for our neighbors nearby who deserve a mini getaway. Spend a weekend with old friends and take advantage of world-class boutique shopping in Georgetown. Enjoy a getaway with a special someone for a night of fine dining, sightseeing and a play at the Kennedy Center. With this package, we offer you a chance to become a tourist in your own city. The moments worth remembering are the moments shared with family. Our Family Package offers a pair of complimentary unlimited-ride Metro passes to get your family around. Free valet parking and children's accommodations afford you the freedom to do more. Ask our concierge for tips or adventure on your own — give your kids a trip they won’t soon forget. Escape the hustle of everyday life and reconnect with your significant other. In-room champagne helps set the mood while Relax & Rejuvenate offers in room couples massages to purge the stresses that plague you. 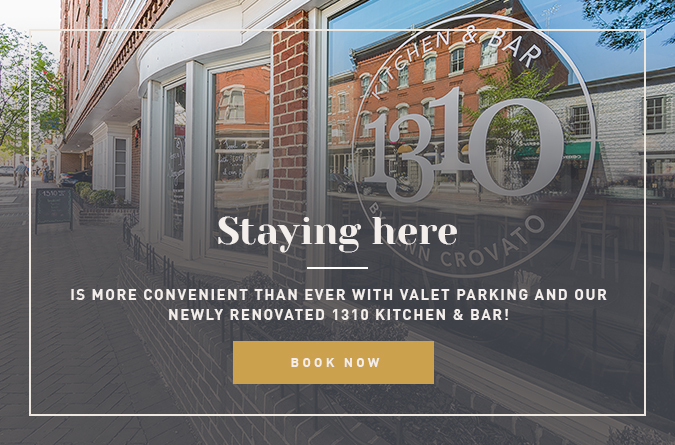 Get complimentary valet parking and spend more time with your loved one, treating them the way they deserve to be treated — like royalty. Discover the history of our nation's capital with the Washington, D.C. Tour Package. Get deluxe accommodations and a two-day, unlimited-use ticket per person on our favorite D.C. double-decker bus tour. See the major sights and landmarks of Washington, D.C. and customize your experience by choosing where to stop along the way. Tour includes pick-up and drop-off near The Georgetown Inn. Children under the age of 3 are free. Discover decades of journalistic history, just minutes from your residence. Dedicated to news and storytelling, the D.C. Newseum memorializes pivotal reporting and fallen journalists through a series of interactive exhibits. Reserve this package, receive two tickets, and build an appreciation for The Fourth Estate. Focus on work, not your wallet. Maximize your business potential with our Business Traveler Package. Our location provides easy access to Downtown D.C., DCA, and Rosslyn, and complimentary valet service takes the hassle out of parking. Get availability-based room upgrades, access to our 24-hour Business Center, and room rates starting at $179 per night to help you take on your big day. Spend your weekend getting some much-needed R&R. Properly prepare for a day in the city — greet the morning from your plush bed, and enjoy a savory breakfast without so much as leaving your room. Whether you’re in the mood for eggs or avocado toast, our in-house kitchen has you covered, so you can splurge on lunch or dinner. Experience city hospitality at suburban prices. Save anywhere from 5 to 25% on your accommodation when you book 14 or more days in advance and expand your “fun” budget. Give your college grad a proper send-off into the working world. Nightly rates for Georgetown University’s 2019 Commencement start at $419 and are available when you book a minimum three-night stay. For more information, contact Tiago Santos at (202) 298-6409.